One of the key elements for Windows Insiders who are testing the Preview of Windows 10 for Phones is providing feedback. Feedback is the only way that the next generation of Windows on mobiles will improve both from a stability and performance perspective but also a general user experience view. Therefore providing feedback is key. 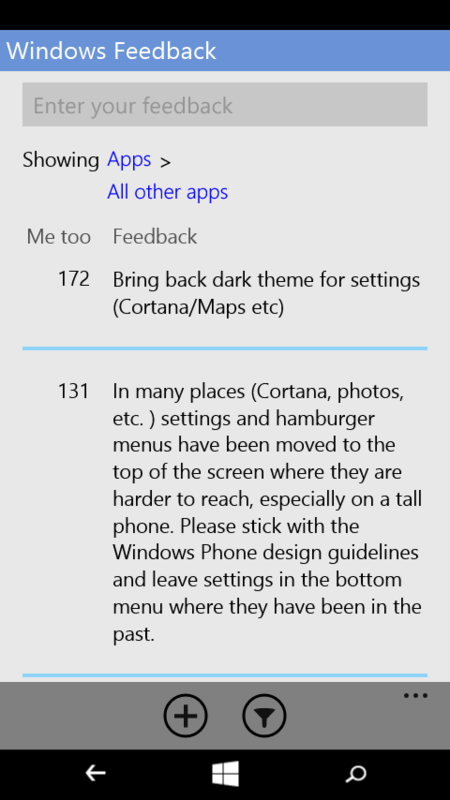 Fortunately Microsoft has made it very easy for you to provide feedback on any app no matter which one it is or what you happen to be doing on your Windows Phone. It’s a great way to collect instant information – including screenshots – and also eliminates any excuses not to give that feedback. navigate to different parts of the feedback app and provide specific feedback about a part of Windows 10 or an app. The feedback app is pretty good about figuring out if you are in an app for example that you want to report an issue or provided feedback with that app. The bottom line is if you are going to test Windows 10 for Phones then take the time to provide as much feedback as possible. That is the only way it will improve between now and its release later this year. Be sure to read my initial thoughts on Windows 10 for Phones and my tips for running the Preview on your Windows Phone.